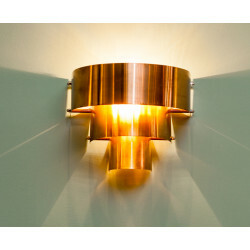 Original wall lamp. Handmade design in Barcelona. 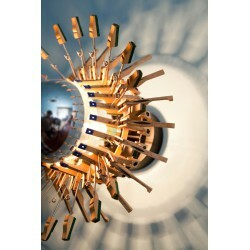 Each lamp is an one-off piece Materials: old piano pieces, metalic structure, E27 bulb (half mirror), 100 W max Dimensions: 33 x 33 x 23 cm. 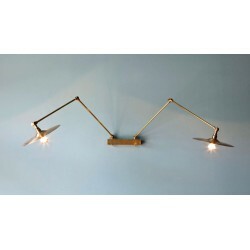 Original design double wall lamp with three articulations. 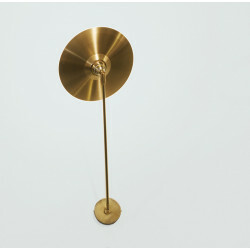 Handmade in Barcelona Materials: brass tubes, real music plate, hallogen or LED bulbs Dimensions: 100 x 70 x 50 cm Options: made to measure: arms number, arms sizes.